Charlie Ferguson’s promising career was cut short. Today, we’re going to dip into the history banks and discuss the 13 no-hitters in the history of the Philadelphia Phillies. 1. 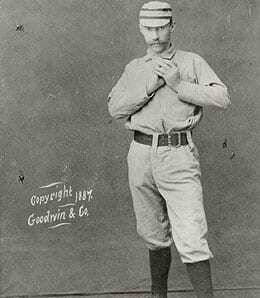 Charlie Ferguson, August 29, 1885: Ferguson was a two-way player who spent four years in majors, all with Philadelphia. He made 170 career starts and completed 165 of them, underscoring how different the game was back then. As a second baseman/outfielder, the switch-hitter recorded a 735 OPS while scoring 191 runs in 257 games. Ferguson led the NL in WAR in 1886, but his promising career was cut short when he died of typhoid fever before the 1888 season. 2. Red Donahue, July 8, 1898: Donahue spent four of his 13 seasons with the Phils and overall compiled a 164-175 record, making 340 starts and tossing 25 shutouts. He led the NL in complete games in 1897 (while setting an MLB record that still stands by losing 35 games) and was known as a crafty pitcher (i.e., not one that relied on the strikeout). 3. Chick Fraser, September 18, 1903: Fraser’s gem was the first no-hitter on the road for the franchise. He had a lengthy career (14 seasons), five years of which were spent with the Phillies. Fraser won 175 of the 434 games he appeared in, but suffered from control issues, three times leading the majors in walks and ranking second all-time in hit batters. 4. Johnny Lush, May 1, 1906: Lush was the first Phillie southpaw to record a no-hitter. He only pitched for seven seasons in the bigs, four with the Phillies. Lush went 66-85 in his career, starting 155 games and completing 105 of them. Another two-way player (630 career OPS), he was the youngest player in the NL as a rookie at the age of 18. Lush’s no-hitter would be the last one for the Phillies for a very, very long time. 5. Jim Bunning, June 21, 1964: As alluded to, Phillies fans had a long wait between no-hitters before Bunning recorded the team’s first perfect game (finishing it off with a strikeout as you can see in the video below). He was inducted into the Hall of Fame in 1996 after a 17-year career (six with Philadelphia) in which he went 224-184 and hurled 40 shutouts. A nine-time All-Star, Bunning led all pitchers in WAR twice and went on to have an impressive post-baseball career as a U.S. Senator. 6. Rick Wise, June 23, 1971: Wise did it all in his no-hitter, smacking two homers in the game as well. He enjoyed an 18-year career, seven of which were as a Phillie. Wise’s career winning percentage was .509 through 455 starts, 30 of which were shutouts. A two-time All-Star, he led the AL with 19 losses in 1978, but did earn the win in perhaps the greatest World Series game ever — Game Six in 1975. 7. Terry Mulholland, August 15, 1990: It was another long wait before Mulholland came through with the first no-hitter at Veteran’s Stadium. He spent 20 years in the majors, six of them with Philly, winning 124 games out of 685 — most of which were as a reliever. In 1992, Mulholland led the NL with 12 complete games and made his only All-Star team the following season. 8. Tommy Greene, May 23, 1991: This was the shortest wait for a no-hitter in franchise history (not including postseason no-hitters) as Greene turned the trick in Montreal, for the team’s first no-no outside of the U.S. Greene spent six of his eight MLB seasons as a Phillie, putting together a career mark of 38-25 with five shutouts. He went 16-4 in 1993, finishing second in the NL in winning percentage, but was pretty much toast after that as his shoulder gave out on him. 9. Kevin Millwood, April 27, 2003: Millwood stuck around the bigs for 16 years (just two seasons with the Phillies), winning 169 games while recording a 4.11 ERA in 451 appearances. In 2005, he led the AL in ERA and wound up with over 2,000 career strikeouts. 10. Roy Halladay, May 29, 2010: Halladay’s perfect game was the second in team history, one of the highlights of his 16-year career, the final four of which were spent in the City of Brotherly Love. He enjoyed a stellar 203-105 career record (.659 winning percentage) over 416 games, 390 of which were starts. A two-time Cy Young winner, Halladay is sure to garner plenty of support for the Hall of Fame when eligible in a couple of years. 11. Roy Halladay, October 6, 2010: This marked just the second playoff no-hitter in baseball history and helped cement Doc’s place as one of the greatest hurlers of his generation. 12. Cole Hamels, Jake Diekman, Ken Giles and Jonathan Papelbon, September 1, 2014: This was the first combined no-hitter in team history and is hard to believe is less than two years old given that this entire quartet has been traded as part of the team’s long overdue rebuilding movement. 13. Cole Hamels, July 25, 2010: As mentioned above, Philly dealt Hamels… just six days after this effort. That’s one hell of a way to give the fans something to remember you by. Now it’s your turn. Let us know in the comments below what your greatest Phillie no-hitter memory is. ESPN owners are taking note of Tomlin’s recent success, as he has gone from 10.7 to 33.3 per cent in just a week. Tomlin’s last two starts have been phenomenal, including a complete-game victory on Friday at Detroit. The Marlins roster is filled with prospects every year. The minute a guy turns 27 on this roster, they immediately get shipped out for another influx of prospects. When your team is 17 games back in the division and half your roster is on the disabled list, it is a great opportunity to see if any of your farm system is ready to play in the show. You know things are going bad when you have players on the disabled list with valley fever.